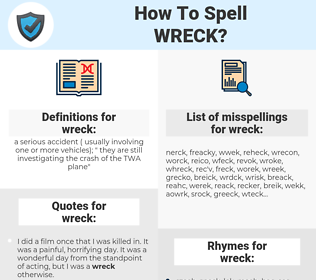 What are the misspellings for wreck? What are the common mistypes for wreck? What is the definition of wreck? What does the abbreviation wreck mean? What are the usage examples for wreck? What are the quotes for wreck? What are the rhymes for wreck? What are the translations for wreck? 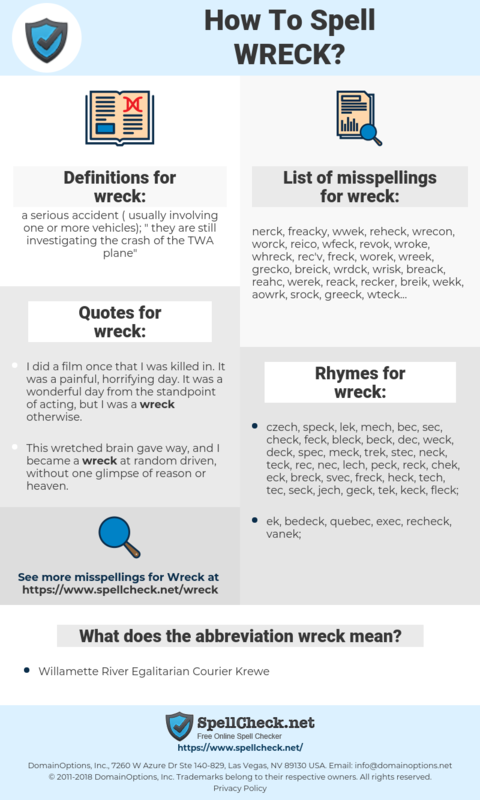 What are the common typos for wreck? This graph shows how "wreck" have occurred between 1800 and 2008 in a corpus of English books. It's truth is attested by more than one wreck in this country already. But I might have known, he added sadly, no one could care long for such a wreck as I! saboter, briser, démolir, ruiner, épave, naufrage, loque, détruire, provoquer le naufrage de, désastre, anéantir. Untergang, vernichten, ruinieren, Zusammenfahren, Ruin, zerschlagen, versauen, zerschmettern, Wrack, Schiffswrack, zugrunde richten, Ruine, Blechkiste, abwracken, Schiffbruch, demolieren, kurz und klein schlagen, destruieren, in Schutt und Asche legen, zu Schanden machen, zum Scheitern bringen, in Trümmer legen, zuschanden machen, devastieren, plattmachen, zu Grunde richten. acidente, afundar, naufrágio, caco, soçobrar, ruínas, destroço. provocar, restos, minar, arruinar, naufragio, destrozar, destruir, hundimiento, ruina, pecio, cacharro, naufragar, aniquilar.